Milk and milk products are good sources of protein and also contain many other valuable nutrients, including calcium, potassium and magnesium. Because milk is often fortified with vitamins A and D, it can be a good source of these nutrients as well. Drink low-fat and fat-free milk if you're on a calorie-limited diet. Milk contains two major types of protein – casein and whey. Casein proteins form curds when acid is added to milk, an important step in the cheese-making process. Casein makes up 82 percent of the proteins found in cow's milk. Whey proteins are those found in the liquid portion of milk that remains after it has been curdled and strained. Both types of proteins are high-quality and provide essential amino acids for protein synthesis. Whey protein, in particular, is highly usable by the body. It is a rich source of leucine, an essential amino acid involved in muscle protein synthesis. One cup of nonfat milk contains 8.75 grams of protein. As fat content of milk increases, protein content decreases slightly. One cup of low-fat milk (1 percent or 2 percent milk fat) contains 8.53 grams of protein. One cup of whole milk (3.25 percent milk fat) contains 7.69 grams of protein. The recommended daily allowance for protein for adults is 46 grams per day for women and 56 grams per day for men. 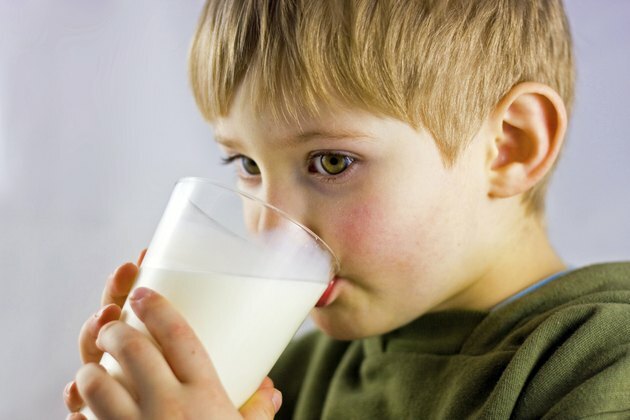 Dietary guidelines recommend choosing low-fat or nonfat milk and milk products for all those ages 2 and older. Low-fat and nonfat milk will provide similar amounts of protein and other nutrients and less in the way of saturated fats and calories. Since the 1930s, Americans have been drinking progressively less milk. In 1970, per capita fluid milk consumption was 0.96 cups per day; in 2013, it was about 0.61 cups per day. Consumption of milk substitutes such as soy milk, almond milk and rice milk, on the other hand, has been steadily rising. Retail sales of plant-based milks are over $1 billion annually. Soy milk comes the closest to cow's milk nutritionally and contains 6.95 grams of protein per cup. Almond milk and rice milk contain far less protein than either cow's milk or soy milk. Almond milk contains about 1 gram of protein per cup, and rice milk contains less than 1 gram per cup. Consuming protein-containing foods or beverages and engaging in resistance exercise are both key ingredients in building lean body mass, or muscle mass. Researchers in Canada compared the effects of soy milk proteins and cow's milk proteins on muscle mass accretion. They found that while consumption of either soy milk or cow's milk, along with resistance exercise, resulted in muscle mass gains, cow's milk proteins promoted increased gains. It is important to note, however, that this was a single study and only included eight study participants. In addition, the study was supported by the U.S. Dairy Council. Can You Gain Muscle While Only Drinking Soy Milk?